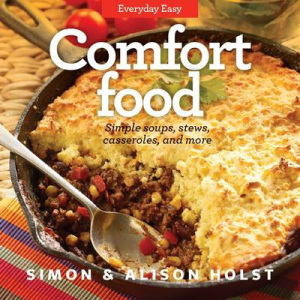 There is perhaps no better time to write a review on Simon and Alison Holst’s Comfort Food than on a cold rainy Auckland night – especially with the knowledge that something delicious is simmering on the stove. No it’s not from the cook book sadly but it is a slow cooked Brazilian fish stew. I’ll be honest. I adore comfort food. But equally, I don’t necessarily believe that the best comfort food comes quick and easy. For that reason some of these recipes I’ve welcomed like old friends and others, well, let’s just say, they’re lovely acquaintances – especially when time is a luxury one can’t afford. For example: Alison’s Oakhill Potatoes. I’ve made these myself over the years (thank you Alison) and my own mother always has cooked potatoes on hand in her fridge as they quickly disappear into a variety of easy, and to be honest, easily gourmet meals such as this. It has all the compulsory ingredients, hardboiled eggs, bacon (optional), potatoes (obviously) and with a dash of mustard, a chunk of grated cheese and some butter, milk and flour and voila! You have the perfect meal no matter how old are your dinner guests. Other similar recipes are the beef casserole with parsley dumplings (and although I know curry powder is something of a given in some recipes I prefer whole spices) and the Tuscan style Chicken baked with Tomatoes and Olives is as simple as its title indicates. Good quality ingredients will make the difference especially in the latter. The majority of the recipes are staple favourites: Alison’s Lazy Lasagne, Beef Madras, Sausage and Potato Bake, Cornbread topped Chilli and a few winter warming soups including Corn and Ham Chowder and Kumara, Coconut and Lentil. This could be an ideal go-to recipe book for university students (it’s the shorter version of Edmond’s cookbook for first year flatters, which I still have) and in times of exhaustion when the whānau are demanding ‘what’s for dinner tonight?’ there are a few handy and healthy recipes tucked away in this little volume. But comfort food doesn’t always have to mean we rely on the dependable spud or mince or even the regular pasta that we pick up from the local supermarket. It can mean using a wide range of ingredients in unexpected ways, experimenting with a few and perhaps not so common ingredients. For example soy, now a common household ingredient could for some dishes, be replaced with mirin, a Japanese rice wine. And if we feel we must resort to something from a jar or tube what about harissa or capers? Curry powder is an easy additive but the individual spices might be exactly what you’re looking for to give your meal greater depth and flavour. New Zealand’s comfort food has a long and cherished place in our history but a few contemporary twists wouldn’t go amiss in making that meatloaf just a little more appealing for today’s young/at heart and hungry.